Save your search - find out immediately when "American Presbyterians" is available at auction! Eisenhower, Dwight D. (1890-1969) Signed and Inscribed Photograph. Eisenhower, Dwight D. (1890-1969) Signed Photograph. Burr, Aaron (1756-1836) The Daily Advertiser. 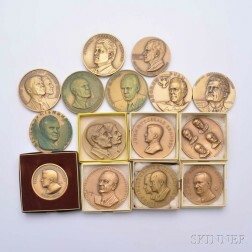 Extensive Group of Eisenhower, Susan B. Anthony, Sacagawea, and Presidential Dollars. American School, 19th Century Portrait of Daniel Finn Seward, Aged 3 1/2 Years, of Middletown, New York, 1855.